The official start of the Iditarod Trail Invitational is always informal and mildly amusing. Race rules stipulate that competitors only need to hit a handful of checkpoints along the route — how they get there is entirely up to them, as long as it’s under their own power. 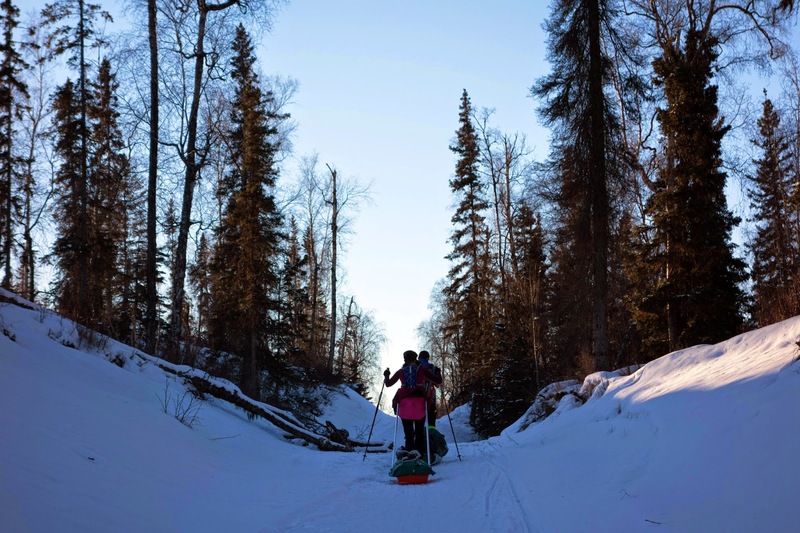 A large majority of competitors stick to the Iditarod Trail — it’s the only established route. But race veterans have their secret tracks and shortcuts, and occasionally participants will test wild deviations. In 2009, two cyclists diverted from an L-shaped section of the Iditarod Trail to try their luck on the direct line formed by the frozen Kuskokwim River. After fifty miles of increasingly difficult surface conditions, the men hit a dead-end of open water with no other options but to backtrack two days' worth of travel. A pilot who was flying over the Kuskokwim happened to spot the cyclists in this most unlikely location, and landed to make sure they weren’t dying. The pilot offered to shuttle them one by one to McGrath, so they took the ride and scratched from the race. No one has attempted such a bold route deviation since. Still, because there’s no required route, most cyclists opt to deviate from the start on a “shortcut” that’s about eight miles longer than the established Iditarod Trail, but includes plowed roads and a power line access trail. Runners, whose top speeds don’t waver much, always stick to the shortest route — which is hillier, more remote, and has a higher chance of soft trail conditions. The official race starting line is simply a banner strung across birch trees on the edge of Knik Lake, an oval-shaped puddle that nearly touches saltwater on the shore of Knik Arm. Knik Lake would never be noticed by anyone were it not officially mile zero of the Iditarod Trail. The race start is same every year: Most of the bikers make a U-turn back toward the road, and all of the runners launch forward across the lake, sprinting as fast as their sleds will allow. They always run. It’s a race with a “sprint” distance of 350 miles, but everyone launches off the line as though the gun just sounded for a 5K. Mix an explosive release of cortisol with showboating for three dozen spectators, and just about everyone’s fastest speeds in the race take place in the first hundred yards. Reality sets in very shortly thereafter, when the trail takes a sharp turn off the lake to climb a steep embankment. Those who haven’t already stopped to readjust their sleds scramble up the hill like scared cattle, throwing arms and trekking poles into churned powder as they clamor for the lead. At the top of this hill, everyone will be entirely out of breath and finally ready to accept that this is a race of days, not minutes. Paces adjust accordingly. Beat and I planned to run our own races rather than try to stick together. He still intended to run the 350-mile distance self-supported and not go inside checkpoints, which would clash with my plan to sleep indoors whenever this option was available. Clashing with these intentions were more deep-set motivations — I was sled-dragging this year to not only experience the trail in a new way, but also to share the experience with Beat, who values his yearly sojourn on the Iditarod Trail possibly more than anything else he does. Still, I understood the difficulty of linking mismatched paces in an environment where motion is our best source of heat, and also the rewards of solitude in a difficult journey, for both of us. I also suspected Beat was conflicted about partnering up, but if Beat wanted to hang out with me, I would gratefully accept his company. The small foot division was an eclectic group of familiar faces. Tim Hewitt, the Pennsylvania attorney who had completed the thousand-mile journey to Nome an unprecedented seven times — including fully unsupported in 2013 — was returning for an eighth. His wife, Loreen, was a three-time finisher of the 350-mile race making a second attempt on the full distance. 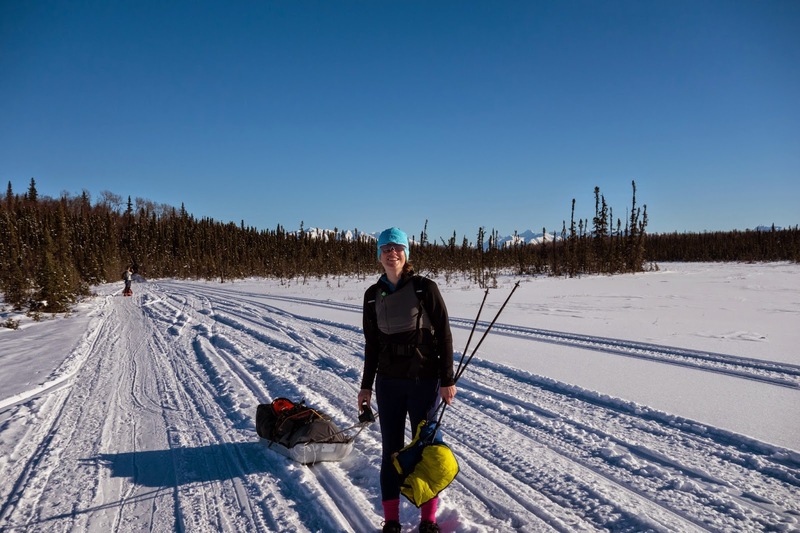 Having stopped in McGrath in 2013, she was determined to see this journey through to the finish, along with their friend Rick Freeman, who called off his first Nome attempt in 2012 (along with everyone else that year). 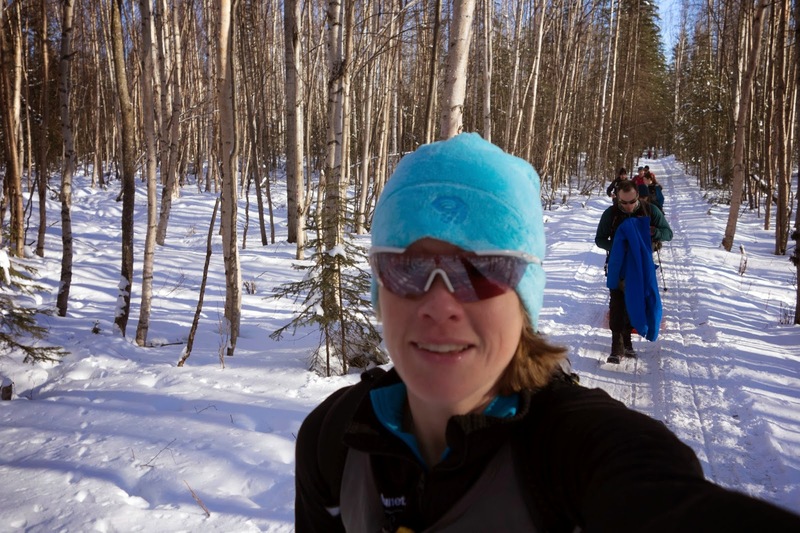 Shawn McTaggart, a recent transplant to Southcentral Alaska, was the only woman to have completed the trek to Nome on foot within the perimeters of the race, and was aiming for a finish on the Northern Route. Anne Ver Hoef, another Anchorage resident and regular participant in the short race, was also aiming for Nome. Steve Ansell joined Beat and me in the California-based contingent. John Logar of West Virginia was back for the full meal deal after completing the trek to McGrath in 2013. Jason Buffington, who the previous year placed well in the cycling division, returned to make an attempt on foot — upending the singularity of being the only veteran to embrace a new mode of travel that year. Jason would eventually team up with Parker Rios in a five-day blitz of the route. There were three rookies — Jason Boon from Minnesota, Carole Holley from Anchorage, and Peter Ripmaster, a fifty-states marathoner from North Carolina who showed up for the 350-mile race with an expedition sled that weighed ninety pounds. And then there was Dave Johnston — an unassuming Susitna Valley local with a knee-length pony tail and a playful demeanor that masked fierce determination. Dave won the previous year’s race in near-record time — a record that many considered untouchable. This year, he intended to break it. Even though Beat and I started at a leisurely pace, by the time I scrambled to the top of the fifty-foot embankment of Knik Lake that should be called “Reality Hill,” my calves were already searing and my hamstrings were alarmingly sore. I brushed this off as “phantom pain” brought on by nervousness, but my sled dragged behind me like a reluctant pet willfully pulling backward, and I had to admit that I was probably undertrained for this effort. California living, while providing ample opportunities for warm January mountain biking and delicious sushi, is not conducive to training for snow-based efforts. Snow, even packed snow, demands different motions and more difficult efforts than one might expect, or remember while training on dirt. Add forty-five pounds of extra weight, and difficulty scales tip toward unsustainable. I’d made some efforts toward improving my strength. I increased my hill training, and frequently set out for jogs/hikes while dragging a two-wheeled bike trailer loaded with seventy pounds of cat litter, which Beat outfitted with disc brakes to add resistance and mimic the effects of snow. These efforts helped, but they didn’t really make me strong enough to drag a loaded sled 350 miles over hills, mountains, and rivers, in the span of a week. It’s my belief that women in general have to work harder to build strength for weight-based efforts. Historically men did all of the “man-hauling” in big expeditions, and even today mountaineers and polar explorers are male by a large majority. Women of course are more than capable of the strength for man-hauling — look at all of the women backpackers and firefighters out there. But with less muscle mass and lower body weights, most of us really do have to work harder to achieve the abilities that come more naturally to men. I admittedly did not work for it. I could have been lifting weights, pursing strength-building workouts … but I was having too much fun riding my mountain bike through California’s warm, sunny winter. It was my fault that I did not feel strong. And I still had 349 miles left to pay for my lassitude. Carole pulled hard up the many steep hills that ripple across this former glacier moraine of a valley, and I envied her strength and her home court advantage. When I said as much, she promised me she was struggling as well, that her sled had only recently been purchased at REI and she wasn’t yet sure what to do with it. She told me about a near-disaster in the minutes before the race, when a pole attachment broke and she barely fixed it in time to start. She still wasn’t sure whether her repair would hold. I supposed that there was a fair chance that most of us, even the locals, didn’t really know what we were doing out there. Except Tim, of course. As of the start, Tim still hadn’t decided whether he’d accompany Loreen for the entire distance, or make an attempt on an achievement that has eluded him in the past — the Northern Route record. 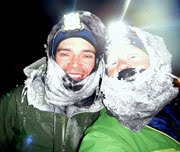 Tim holds the overall record on the Southern Route, but believes the Northern Route can be blitzed in nineteen days or less. After knee surgery and a long recovery, he admitted that his knee probably wasn’t up to the task this year, and was conflicted about leaving Loreen to take on the difficult journey all alone. Tim was hanging back for now, but he and Dave were two people I did not expect to see again after the first day. 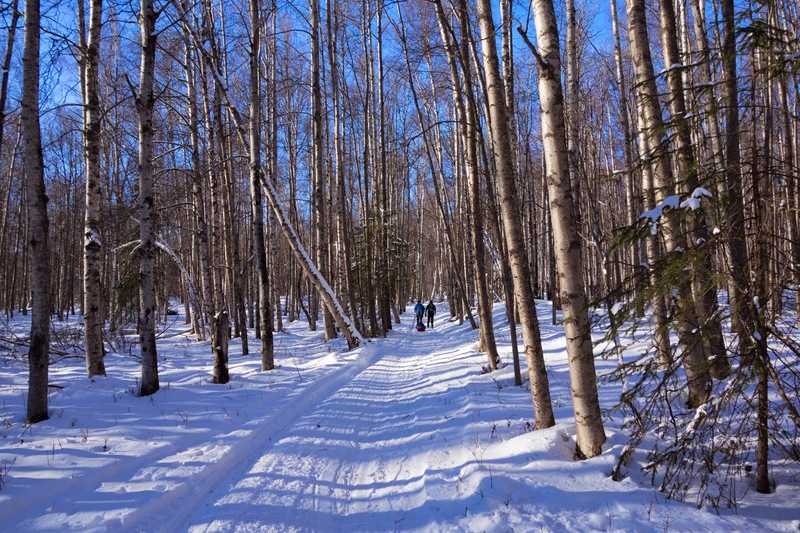 In general, the Iditarod Trail is not a difficult route to navigate. 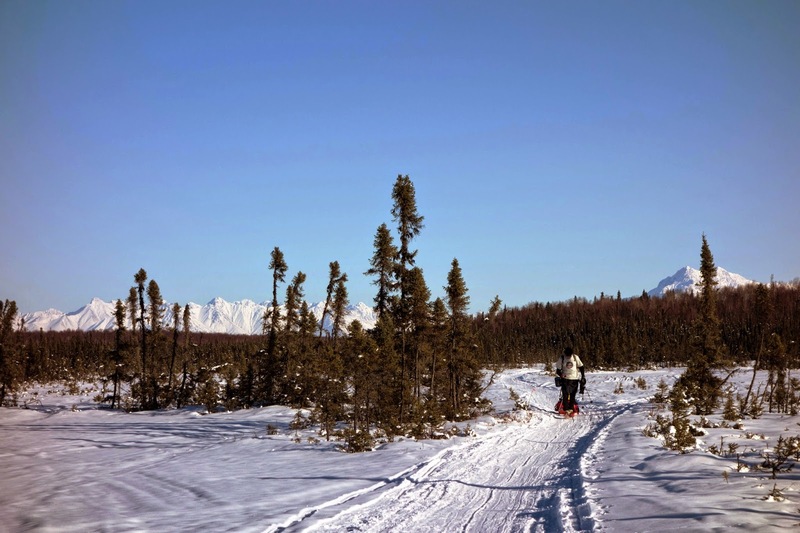 For most of its distance, the trail cuts through regions so remote that this thin ribbon of tree clearings, tripods, and snowmobile tracks is unmistakably the only way to go — as long as you can see any evidence of a trail at all. 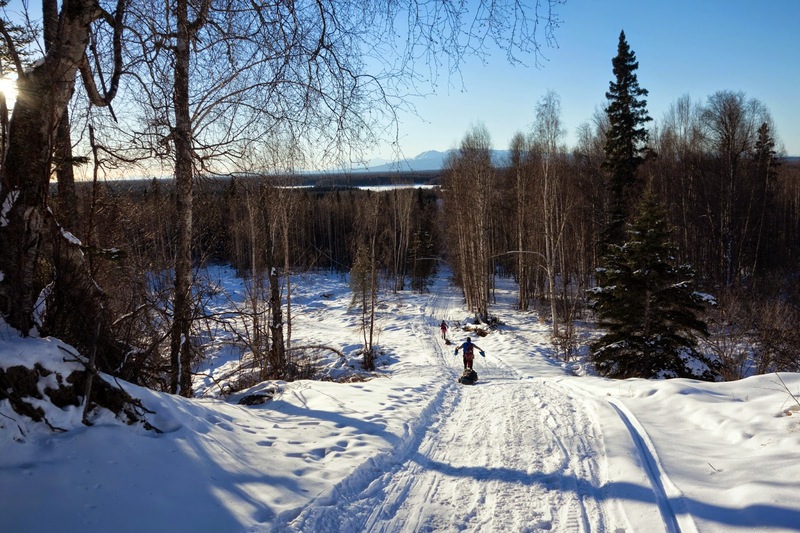 The only exception to this is the first thirty miles, where the Iditarod meanders through a maze of rural properties, dog mushing trails, seismic lines and trapper routes. Quite a few people have gotten lost during the Invitational, but it almost always happens on the first day. We were following Tim’s signature serpentine sled track and nearly took a wrong left turn, but were pointed in the right direction by Tony Covarrubias, a previous 350-mile finisher who ran out to cheer for his wife, Shawn. Most everyone else in front and behind our group of four — Beat, me, Carole, and Steve, plus Shawn — took the tripod-marked wrong way. The glittering sunlight faded away surprisingly soon, which is what happens when a 2 p.m. start meets a 6 p.m. sunset. Traveling at three miles per hour, we hadn’t even yet reached the fifteen-mile mark at the Little Susitna River before twilight began to settle. In 2008, I was turning onto the Yentna River near mile forty when the sun went down. With these landmarks still fresh in my memory, the difference in effort expended versus distance covered was disheartening. I think on some level I’d let myself believe that snow biking was not that much different than sled dragging. On some level, it’s not — as long as you’re pushing the bike, not riding it. This was going to be 350 miles with four miles an hour as a top speed, and no coasting. The reality of that was beginning to sink in. We pulled off the trail to layer up, because in these low river valleys, the day’s balmy twenty degrees can plummet to minus twenty degrees as swiftly as turning off a light. Salmon-colored light stretched across the sky, and the profile of Mount Susitna — “the sleeping lady” — became a placating beacon on the horizon. Steve lingered to take it all in — the frozen meadow, the pipe cleaner spruce forests, the far-reaching mountains. A biting breeze whisked around my cheeks and nose, and my toes began to hurt almost as soon as I stopped. During the limited gear testing we were able to complete over Christmas break in Fairbanks, I’d decided on a system that I believed would keep my feet warm without subjecting them to the sweat marination that resulted in painful trench foot, which I’d endured in all of my winter foot races so far. Gortex trail-running shoes, a pair of Drymax socks, and a pair of Acorn fleece socks — the kind they make for people who like to curl up on their couches and sip hot chocolate. If it was really cold, I’d add gaiters, and possibly an extra layer of fleece socks. My shoes were more than large enough to accommodate anything I wanted to stuff inside. I’d ordered them online — Montrail Mountain Masochist. In my previous races, I used women’s size ten, and decided I wanted to go a half size up. Ten and a half wasn’t available, so I ordered elevens. The problem is, I accidentally clicked on men’s shoes in the sizing chart. These were men’s size eleven. For perspective, my usual women’s eight and a half is 9.6 inches long, and these shoes were 10.9 inches long. They were enormous, and brand new. I’d ordered them too close to the start, and there was no turning back. Maybe it was because my shoes had too much open space inside of them, or maybe I should have better chosen my layers, but my feet became cold and stayed that way, almost constantly. I had led myself to believe that runners never get cold feet, and yet I could barely keep the blood circulating even I was moving. When I stopped, a vice of pain and numbness clamped down fast. Still, I was still so terrified the hot-coals pain of trench foot that I couldn’t bear the thought of putting on the pair of vapor barrier socks that I brought for extreme cold and emergencies. I decided that if I started to feel real numbness, I’d deal with it, but as long as I simply felt tingling pain, I’d just cope. At mile eighteen, there’s a randomly placed wooden sign that points the way to Nome. Tim and Loreen caught up to us again just before this sign after finding their way back from their wrong turn before the Little Su. Tim yelled to us that we were going the wrong way, and we argued that “the Nome sign is this way,” and it turned out we were right. It was starting to feel late. We stuck in a loose group of six before dropping onto a slough Flathorn Lake, where Beat and I wanted to try a “sneak” the bypassed the lake on a direct line through the woods. The trail was hilly but solid, and we soon caught up to Anne and two others (maybe Jason and John), who had been following the tracks of four cyclists who took the traditional trail. The cyclists had apparently turned around, and Anne wanted to as well. I argued that the Iditasport 200-mile race used this trail three weeks earlier, and I was certain it went through. After several minutes of cold-foot arguing we continued forward, but Anne became more agitated about the possibility of hitting a dead end. When we reached the crossing of another slough of Flathorn, she made the decision to cut down the slough toward the Lake, and Beat decided to follow. I was a little too far behind the main group to argue, but I was strongly against crossing the slough. This was the slough where, at its mouth on Flathorn Lake, I broke through a pressure crack in the ice and soaked my right leg five years ago, ultimately freezing my foot. Sloughs are notorious for bad ice, and it had been a warm winter — the Susitna River Valley was only then coming out of a long thaw that left the whole valley nearly stripped of snow. As I followed the group’s tracks, my heart raced and I began to hyperventilate. Old and well-earned fears of bad ice and this slough specifically swirled in my head until I thought I might not be able to fight off a panic attack … and wouldn’t that be embarrassing thing to succumb to less than twenty-five miles into this difficult and dangerous race? I concentrated on breathing and placing my feet precisely into Beat’s unmistakable set of large footprints, trying not to think about cold feet and bad ice and that one time I narrowly avoided a fatal plunge to the bottom of Flathorn Lake. No one broke through the ice, and as we re-entered the forest, my surging adrenaline lost steam and plunged into a lake of fatigue. “Has it even been ten hours yet? It’s way too soon to feel so tired,” I scolded myself as our dispersing group trickled onto the moonscape of the Dismal Swamp. A train of headlamp beams stretched across the frozen expanse. To the north, a fluttering display of Aurora Borealis stretched over the distant peaks of the Alaska Range. Using the string of faint torches as a trail guide, I turned off my own handlamp and gazed up at the sky, craning my neck to fixate on the arching glow. Phantogram was playing on my iPod, and marched in a trance, utterly mesmerized. In a way, it was like those silly dance clubs that felt so transformative when I was a teenager — those same soaring feelings still resided in my jaded 34-year-old body, only now they were flowing with the incandescence of the universe — the emerald Northern Lights, the white stars, the faint reds and blues of the Milky Way. Fatigue eradicated and fear forgotten, I stretched toward a sensation as close to transcendence as any I have felt. Immediate reality returned when the woods closed in again, and the fatigue came back more crushing than before. 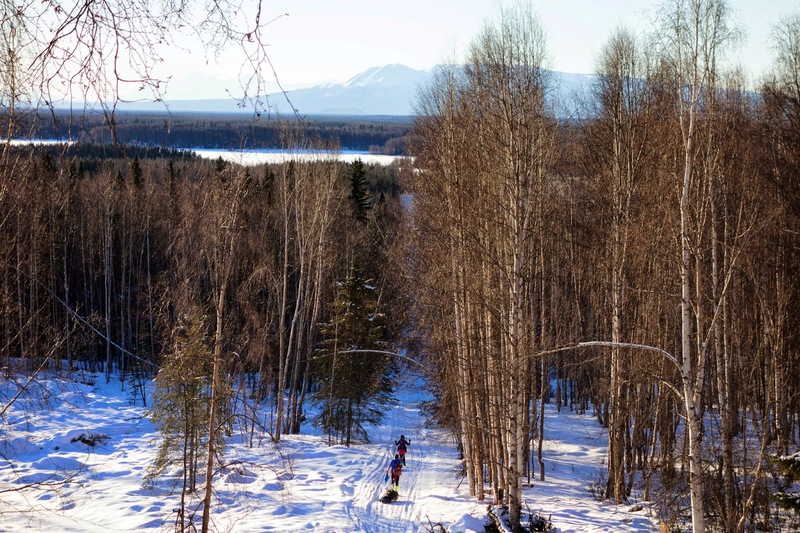 I focused on breathing as we marched up to the bank of the Susitna River, at a point on the trail known as The Wall of Death. 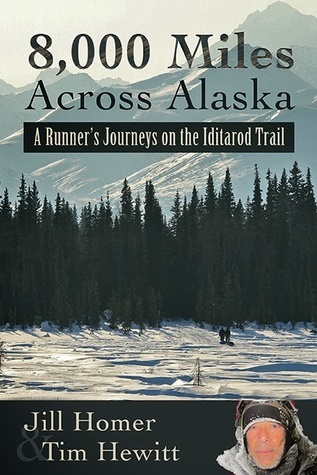 This harrowing title is derived from the fact that the trail drops off the river bank at a near-vertical angle — a horizon line you can’t see until it’s too late, you’ve hit the ice patch at the lip, and you are going to crash brilliantly onto the river twenty feet below. My favorite encounter with The Wall of Death happened during the 2011 Susitna 100. It was my first attempt at a hundred-mile ultramarathon, a few months after Beat and I started dating. Beat stayed with me throughout the duration of what would turn out to be a 41-hour race, coaching me and offering words of encouragement. By mile seventy, I was in some of the most persistent broad-spectrum pain I had ever felt, I was sick and nauseated, and I had slowed down to the point that math was not working in my favor to reach the finish before the 48-hour cutoff. When Beat pointed this out, I threw a temper tantrum, declaring that “there would be no more hundred milers, ever” and that I didn’t even care whether I finished this one. Beat moved on ahead to give me more space while I went through the motions of angry muttering, sobbing, and finally defeated numbness. After twenty minutes of this, I crawled up the Wall of Death and found Beat sitting just off the trail. He had rolled out his sleeping pad and laid out a smorgasbord of chocolate, jerky, and crackers — he made a picnic for me. “Here, sit down and have something to eat. You’ll feel better,” he said. I curled up next to him and nibbled on chocolate until my pain and nausea faded behind feelings of peace and security. The gesture was so endearing that I let myself believe there was nothing that could prevent me from finishing Susitna — as long as I had Beat with me. Now, three years later, Beat and I had returned to the Wall of Death, spreading out our sleeping pads beneath a stand of tall birch trees. 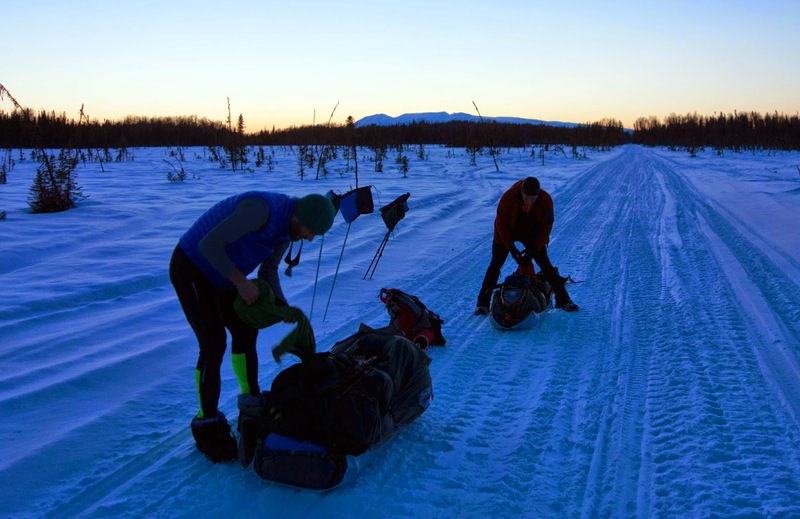 Before the race started, we agreed that we’d rest for a few hours just before dropping into the Susitna, because the next thirty miles was wide-open river with nowhere to camp before the next checkpoint. As it turned out, Anne and at least three others had the same idea. A few minutes later, Tim, Loreen, and Rick showed up at our crowded encampment. “Wow, it’s a party,” Tim said as they unpacked their gear. I don’t think Tim had ever thought to stop to rest this early in the race, but it was the best idea for the others who were planning to go all the way to Nome. Before crawling into my bag, I added some snow to fill up my Hydroflask thermos before stuffing it into the down cocoon for body-heat thawing, then changed into two pairs of dry socks so I could put the wet socks against my torso to dry — because dry feet are the key to happiness. Most everyone else was snoring by the time I finished my little chores, and I whispered goodnight to Beat. I was far from alone on the Wall of Death, but I was really glad he was here with me. Nah, women don't have to work harder to gain strength and muscle mass. That's a myth. A lot of guys start lifting in high school, women tend to start lifting later in life since girls aren't encouraged to build strength like the guys are. So there's some catch up to play if you start late, and the later you start, the farther behind you are. I know dudes want to think they are just naturally stronger, but they're not. We'll see this start to shift over the next few generations as girls are encouraged to get involved in sports at a younger age. ?? It's not a myth--testosterone increases muscle mass. That's why taking testosterone is doping. And what do men have in much greater quantities than women? Testosterone. One more thought - women are barraged with messages about how we should diet constantly and eat less, but you have to eat like a horse if you want to gain strength and muscle. That's just another obstacle for women to overcome to get really strong. We have all that social pressure working against us. In my (much smaller than yours) experience, men tend to be stronger earlier in a long race while women finish stronger or are steadier the whole way through. Whatever the case, I love being able to live out these races through your words. I was referencing the strength to haul an extra 45-50 pounds of weight, for any distance. I didn't feel like Googling a bunch of scientific studies, but I think it's difficult to argue that men and women start at the same baseline when it comes to raw strength. Take an inactive 135-pound woman and an inactive 170-pound man, strap 60 pounds to their back, and tell them to climb a half-mile-long hill. Who do you think would finish first? If you still think the woman or that they'd tie, I'd be really interested to hear your arguments. Mine would be that the man's inherently higher muscle mass, weight ratio, and testosterone gives him the edge. In both the Iditarod and Freedom Challenge, one of my largest sources of frustration was how weak I felt for bursts of strength when it came to hauling my sled, hoisting my bike over a gate, or carrying my bike up a rock scramble. I own up to the fact that I didn't train adequately for this, but it was frustrating to watch all of the men around me not struggle nearly as much, when I know they didn't train much differently than I did.